Bose headphones are world renown for their fantastic noise-cancelling, exceptional comfort, and enjoyable sound quality (plus a premium price). Introducing a quick guide to the best Bose headphones to buy, so you can save time, and make a good decision for yourself. Check the comparison below. Why is Bose Such a Popular Brand for Headphones? What Kind of Sound Signature Bose headphones have? Wondering what Bose models are actually the best for your needs? If you’re looking for a balanced sound signature, sensational comfort, and good build-quality then these headphones might be for you. Choose from a wide variety of designs and technology that Bose offers. 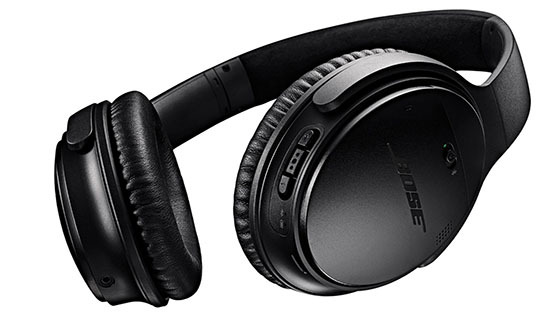 The best wireless and noise-cancelling headphones from Bose. These are the latest and best noise-cancelling headphones from Bose. The QuietComfort 35 over-the-ear wireless headphones deliver everything you expect from premium headphones. You get best-in-class noise-cancelling, exceptional comfort for extended use, good build-quality, many additional features, and enjoyable sound quality. Noise-cancellation is the best Bose has ever created in any of their headphones and it can easily compare to other premium ANC headphones. Additionally, you get plush, memory foam earpads that make you forget you’re wearing them. Bose is known for great comfort and these are no different. Add to this 20-hour battery life (40 wired) with active noise cancellation and Bluetooth enabled. Plus, the option to connect multiple devices, built-in controls, microphone, foldable design, and the option to use them with wires (when the battery dies) and you get to see why QC35 are our top recommendation. Moreover, the audio quality doesn’t disappoint. It’s typical Bose sound signature (somewhat balanced) with a good bass that is suitable for all music genres. For the top-tier Bose headphones right now, get QuietComfort 35 that offer everything Bose knows at the moment. The ANC Bose offers is remarkable. They produce, hands down, one of the best (if not the best) noise cancelling headphones in the world. Check their models below or for other brands, see this guide (ANC headphones). The best wireless headphones (without noise-cancelling) from Bose. Bose SoundLink II are the latest Bluetooth over-ear headphones that don’t have noise-cancelling. If you don’t have about ANC but still want fantastic comfort, wireless connectivity, and Bose sound signature SoundLink II are for you. Before you jump further below, you might want to know the difference between noise cancellation and noise isolation. It’s worth understanding. Moreover, these are compatible with all Bluetooth enabled devices, (Apple and Android) and have a 15-hour battery life (rechargeable lithium-ion). The cool thing is, you can keep them connected to 2 devices at the same time. The earpads are thick, soft and feel great even for long hours. Moreover, the headphones are very lightweight which makes for exceptional comfort. Together with the foldable headphones, you’ll also get a nice carrying case to store them, a charging cable, and an AUX cable in case the battery dies. 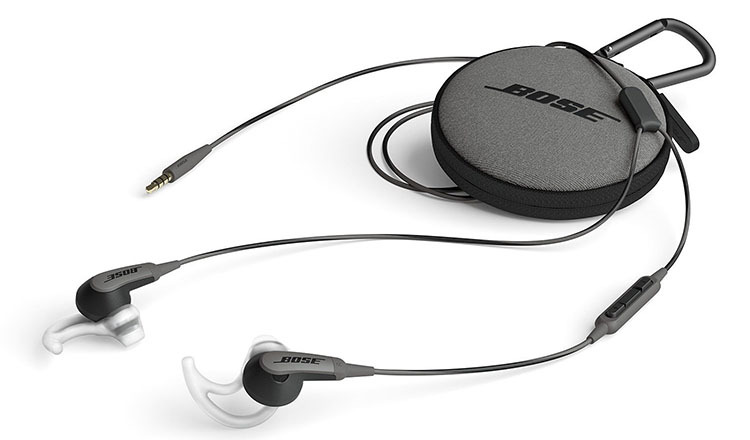 All of this is rounded with the typical Bose sound signature which has a balanced tone to it. SoundLink II sound great for all types of music and are the best wireless over-ear choice from Bose right now. 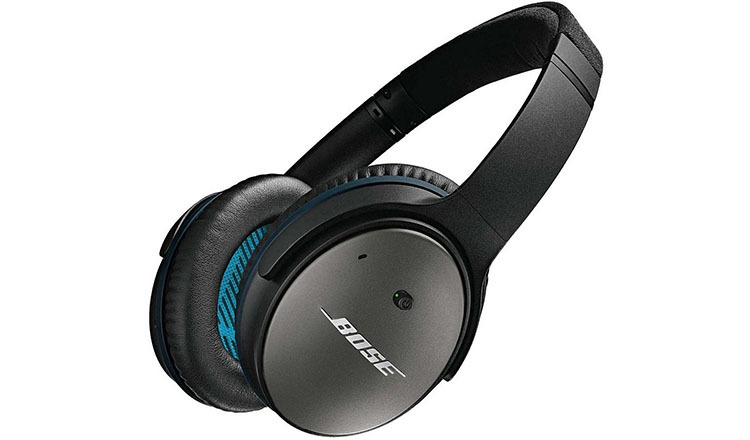 The best wired noise-cancelling headphones from Bose. The QuietComfort 25 is the top choice if you want amazing noise cancellation but don’t need wireless functionality. This older model has the same amazing comfort as the rest of the series. With the soft foam earpads and good cushioning on the headband, you can wear them for hours. Moreover, the noise cancellation is state of the art and it lasts for about 35 hours with one AAA battery. If it dies you can still use them without noise cancelling. Additionally, you get a nice carrying case to make them portable. There are 2 options, one for Apple devices and the other for Android. The only difference is the cable. The in-line controls can only work for one type of devices. These wired noise-cancelling headphones can be yours for a considerably less than the wireless option. The QuietComfort 25 are the best wired ANC headphones (that you can even make wireless, more on this below). How Do You Make Bose QuietComfort 25 Headphones Work Wirelessly? By attaching a simple mod called AirMod. This is a Bluetooth adapter that cost around $60 (as of writing this). It attaches to the 3.5mm AUX plug and gives up to 8 hours of wireless functionality per full charge. It also has built-in microphone and controls for easy song selection and hands-free calling. The mod is Apple and Android compatible and is a great addition to your headphones. Check out the latest price here. In case you don’t want to pay for all the features, but still want to get a pair of super comfortable Bose over-ear headphones, SoundTrue II is the answer. While these don’t have Bluetooth or noise-cancellation, they make up for it with the price. It’s the cheapest over-ear pair of headphones from Bose (if you consider the latest models only). You can connect them to any 3.5mm device (AUX). They have a detachable cable with in-line remote and mic for easier storage. You also get a nice carrying case since they fold flat and you can store them for easy transport. Moreover, the comfort is the same as with more expensive models because they use the same earcups. The padding is made of memory foam which feels good on the skin. You can easily wear them for hours in comfort. Furthermore, the sound signature is standard Bose. It is rather balanced and sounds great for all music genres. If you want to get the cheapest around-the-ear headphones Sound-True II are your best choice. If you don’t like the bulk of over-ear headphones you can get yourself a smaller package. These tiny earbuds offer great comfort and respectable noise-cancellation. ANC is the best-in-class for small headphones. Click here for other ANC in-ear headphones. Since they’re wired, you can connect them to any 3.5mm device but you still need to charge them for noise-canceling. In fact, the built-in battery lasts up to 16 hours per full charge. Additionally, you get an in-line remote and microphone for changing songs and making calls. Connect any 3.5mm to Lightning with this adapter. The Stay Hear+ ear tips are very comfortable and stick to the ears well. there’s also an “aware mode” for when you want to hear your environment. Get all of the above with the standard Bose sound and you get to understand the appeal of these great earbuds. If you want the best experience of noise-cancelling earbuds then Bose QuietComfort 20 is the answer. Bose SoundTrue Ultra are the cheapest headphones on this list. This is because they are the smallest and most basic in-ear headphones from Bose. There’s no noise-cancelling or Bluetooth. The earbuds are wired (3.5mm) and come with a cable that features an inline remote and microphone. This is the most of “features” you get. They work out of the box, have no battery, and don’t require any software. Moreover, they are very comfortable due to quality ear tips and lightweight design. Bose makes amazingly comfortable headphones even for their cheapest models. In the end, these are as simple as it gets but still have good audio quality and an affordable price. If you need some everyday earbuds with basic function but still want Bose sound, get SoundTrue Ultra. 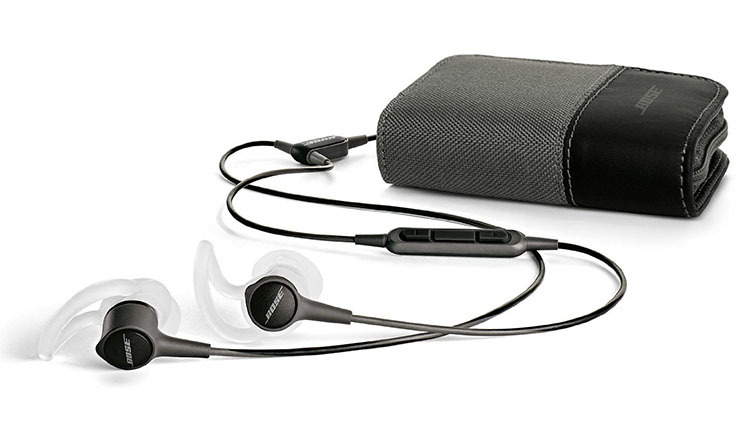 Bose QuietControl 30 are the latest wireless noise-cancelling earbuds from Bose. While noise-cancellation doesn’t seem to be as good, it still performs better than the competition. You can connect them with Bluetooth, to 2 devices at the same time. This means they support all iOS, Android, and other Bluetooth devices. It’s quite useful if you want to listen to music with a laptop and also be ready for calls on your phone. 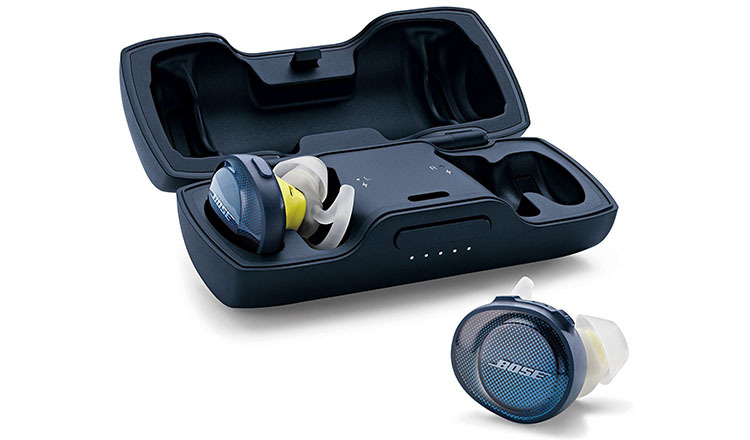 Moreover, the unique Bose ear tips are very comfortable and you can easily wear them for the whole day. After looking deeper it seems many people experience durability problems after a couple of months. Apparently, this Bose model isn’t built to the same standard as others and it’s a bit of a gamble. Keep this in mind. The neckband design might seem bulky and heavy but that’s not the case. It’s quite comfortable and sits nicely around your neck. The battery inside the neckband gives up to 10 hours of music which is great for in-ear headphones with Bluetooth and noise-cancelling. Nonetheless, you should know these are not a replacement of QC20 earbuds because their noise-cancelling is not as effective. Because they have adjustable noise-cancellation their overall effectiveness isn’t as good. On to other topics, since they are wireless you also get built-in controls and microphone for making calls. The best wireless noise cancellation earbuds with Bose sound are the QuietControl 30. There are many good workout headphones you can choose from, and Bose are among the top. For other brands check this workout headphone guide. If you’re into sports and gym, then you have to check the SoundSport wireless earbuds. These in-ear headphones with Bluetooth are deemed as some of the best for working out and running. This is due to their great fit during movement, comfort, and general resistance to sweat. You’ll have a hard time finding more comfortable sports earbuds. Also, since these are Bluetooth, you can connect them to any smartphone or wireless BT device. You get 6 hours of battery life and can also; control music with in-line remote and make calls with the microphone. Add to this a Bose sound quality, and you’ll understand why SoundSport Wireless are one of the most popular workout headphones today. Truly wireless in-ear headphones for sports. 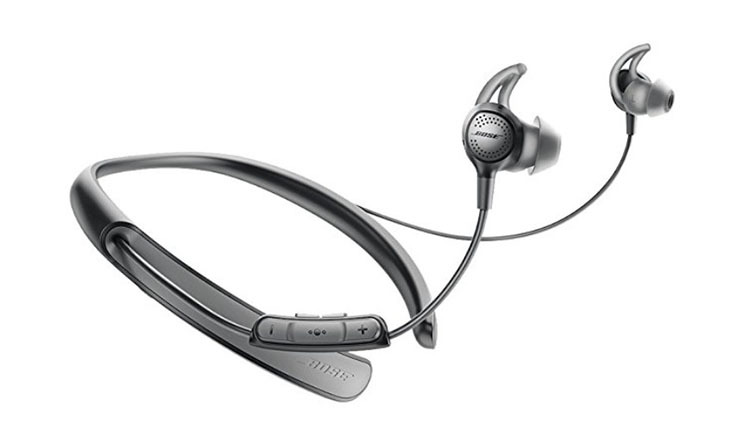 In case you want the latest and best technology Bose has to offer, take a look at Bose SoundSport Free. These truly wireless earbuds give similar performance to the SoundSport Wireless but without any wires at all. These truly wireless earbuds are one of the best in its category for sports. You get solid 5 hours of battery life, plus additional 10 hours in the charging case which works as a power bank. Also, the earbuds are sweat and water-resistant with the IPX4 rating. You can connect them to any Bluetooth device like other wireless headphones. And in case you lose one of them you can track with a special Bose app. They don’t have any noise-cancelling but only noise isolation. The comfort and fit are excellent though not equal to Bose’s other earbuds since these are Truly wireless. 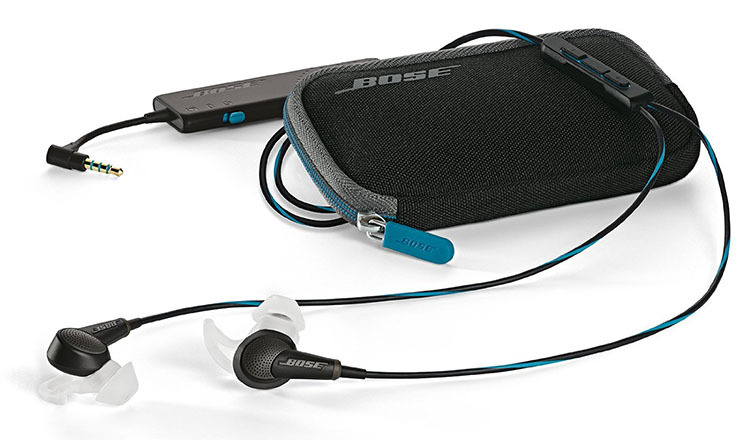 In the end, you get Bose sound quality in a small wire-free package that’s specially made for sports. For the best truly wireless earbuds from Bose, get SoundSport Free. 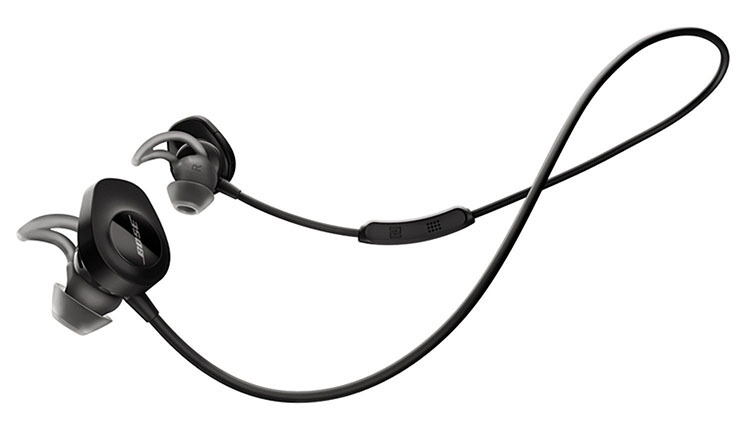 The most basic but also the most affordable sports headphones from Bose are the wired SoundSport earbuds. There are 2 versions; one for Apple and the other for Android devices. That is if you want to have in-line control and microphone for phone calls. You can usually get them under $100. For that price, you get super comfortable in-ear headphones that stay in your ears well even during fast movement. Moreover, the earbuds are very lightweight which makes it easy to keep in place. The earphones are also sweat-proof and can easily survive a bit of rain as well. Connecting is easy and simple. They use the 3.5mm plug. Just make sure your smartphone has it since newer models of iPhone and Android smartphones don’t. Additionally, you get a nice carrying case so you can store them in your backpack or pocket. The wired SoundSport earbuds don’t sound much different. 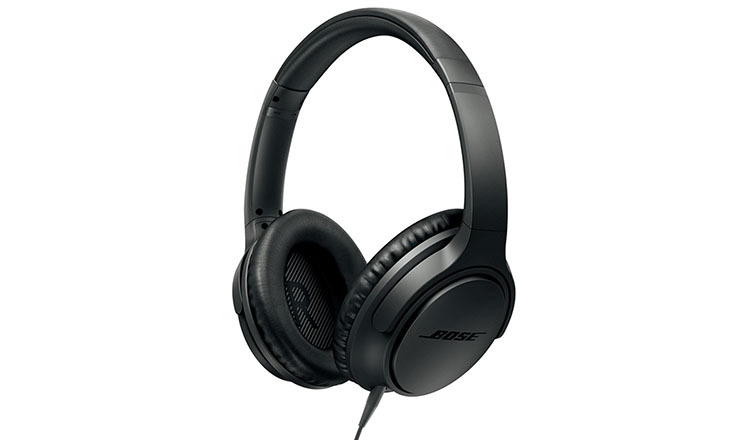 Overall, they have a rather balanced sound signature with typical Bose flair. Good bass and clear treble will make most people very happy with sound quality. In the end, if you don’t mind wired sports earbuds and want something that is reliable, comfortable, and has good sound, check Bose SoundSport wired earbuds. While there can be no arguing Bose headphones are one of the best in major categories, you can find better, especially if you ask a real audiophile. Nonetheless, Bose is very well known and respected by an average consumer. They’ve been the first to introduce noise-cancelling headphones which has helped them create a good reputation. 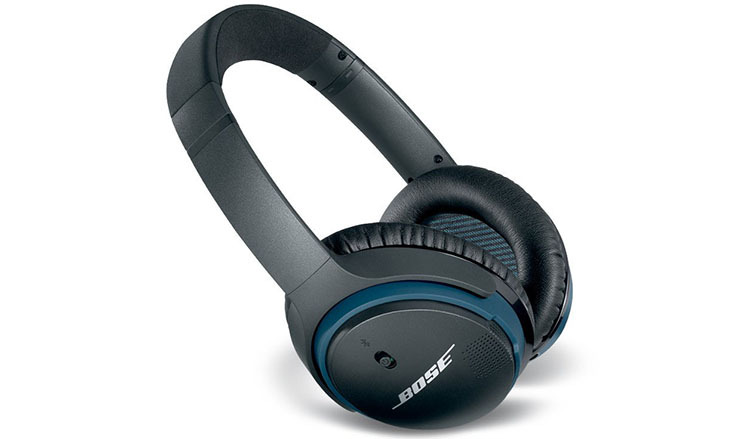 The Bose products are also widely-acceptable worldwide. You can find them at many major retailers and supermarket brands. This has given the brand major recognition and a premium reputation. This is the reason, why Bose headphones are more expensive than the headphones of many other brands. While they aren’t necessarily better or worse (it’s subjective), you have to expect to pay a higher price. There are some differences in how each headphone model sounds, but overall they have a balanced sound signature. This means neither bass, middle range, nor treble is emphasized. All ranges are reproduced in an equal fashion. This doesn’t mean perfect flat response but close to it. This sound signature is great for all music genres and enjoyed by most people.